This beautiful Afghan spirited pendant is an unusual piece like all of the items I have from this Afghan collection. It is made from pure silver and all handcrafted and over 300 years old, it was found in the Northern part of Afghanistan near Beluchistan also known for its abundance of Djinn possessed artifacts. Most of these old pieces are found underground buried for centuries, and all conjured by very skilled spirit conjurers of their time, this Djinniyah like the others belong to a class of very POWERFUL marid djinn that work only for GOOD, they are all muslim Djinn none of them Shaitanic or Dark. This Powerful Djinniyah is a gentle soul that aids one towards dreamscapes and Astral travel, she guides one to reach altered states quickly and easily and shows her master images of the otherworld, effectively connecting them to their inherent spiritual side. By holding the pendant and meditating with it, gazing into it, it will lift you from this third dimensional world to higher places letting you experience other realms and dimensions with little effort, this djinniyah will communicate in whispers before showing herself to you in dreams and visions. She will never appear in a way that will shock or scare her master. 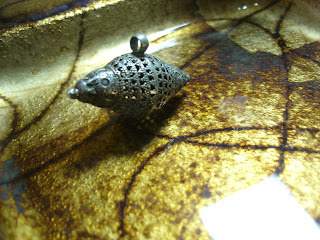 This pendant becomes warm when she is present, and at night sometimes gently glows when she is present, she will come whenever she is called upon, and her energy although gentle, is powerful and loving, she will protect her master in the astral realms where she will skillfully lead you to pleasant places, your dreams will become more colouful and vivid, and remembering them will become easier, astral travel becomes a more frequent activity, and in the mornings you will wake up refreshed and excited about life! This pendant should be worn daily or carried with you for your energies to merge, it will make for a stronger bond between you and your djinn, this goes for ALL djinn items, by keeping them in your own Aura space, it will make for a stronger connection between you and your djinn. If you feel a connection to this Djinniyah and are interested in the Astral realms, she is a wonderful and loving companion, and like all these djinn will grant her masters wishes, as long as they abide by universal and moral Law, Please do not ask that which is against Humanity or creates bad Karma, what goes around will certainly come back again!